Clothes Moths, also known as textile pests, eat refuse matter not eaten by other insects. The problem occurs for humans when Clothes Moths enter our homes or buildings and commence feeding on textile products such as wool, fur or silk and if not stopped can cause serious damage to fabrics such as; underlays, rugs, blankets, carpets, upholstery fabrics and clothes generally. If you need to get rid of Clothes Moths, you need a professional Pest Controller, Control-A-Pest Pty Ltd and we are here to help you with Clothes Moths removal, give us a call now. 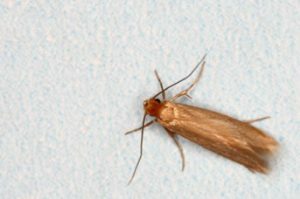 Clothes Moths attack fabrics, usually in the dark and in undisturbed areas. They lay their eggs on or in material that will provide a suitable food source for Laval development and the next generation. A professional Clothes Moths exterminator, Control-A-Pest Pty Ltd, can provide you with assistance in Clothes Moths extermination. If you have a problem with Clothes Moths or other textile, or fabric pests, call a professional pest controller, call us here at Control-A-Pest Pty Ltd for advice and treatment, contact us now.